Frederick Pagan Pride Day Wrap-Up and THANKS! Our donations – over 391 pounds of food! 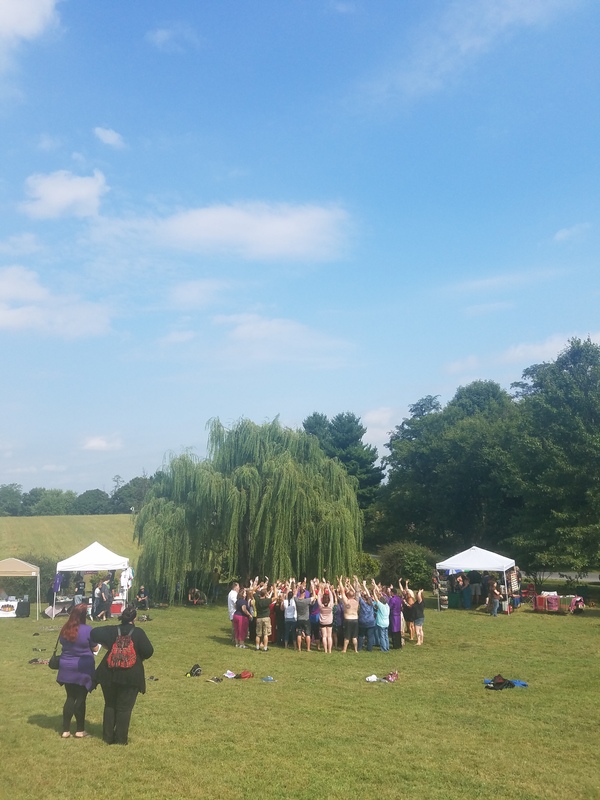 THANK YOU to everyone who came out for the second annual Frederick Pagan Pride Day! What an amazing day! Over the course of the festival, 393 people came through the Welcome area and we raised over 391 pounds of food for the Frederick Food Bank. We are all so grateful for such an extraordinary gathering of shining souls. Photos from the day can be viewed here. A huge thanks to the staff of Frederick Pagan Pride Day (a combination of Frederick CUUPS board members and volunteers). These incredible people choose to devote hours of their time to creating safe and sacred space for our larger community. They stayed late on Friday to help set up, arrived just after dawn Saturday to continue the work and didn’t get home till well after sundown Saturday night. For all those hours, all that effort, all the work that went unseen but was utterly vital to Frederick Pagan Pride Day, deep and heartfelt thanks. Thank you also to the workshop presenters, ritual leaders and performers. The most beautiful container in the world does us no good if it is empty. We are so grateful to the members of the greater Tribe who chose to share their gifts, their wisdom, their energy and their talents with us, who filled our pop-up village with light, love, laughter and connection. Lastly, and most importantly, to the community. Yes, YOU. Thank you for coming to Frederick Pagan Pride Day. Thank you for bringing the best of yourself, for wearing your spirituality on your sleeve, for sharing your time, energy and excitement with us. For donating so generously to our local community with your gifts of much-needed food. You are why we do this. Thank you for coming together as one Blessed Community, one Tribe, one People.This is the symphony, the tapestry of many threads, the universe of many stars. When we shine together, we can accomplish so much. Thank you for letting us be a part of your song, your weaving, and the light you radiate. We can’t wait till next year! If you are interested in being a part of the 2017 Frederick Pagan Pride Day, email us at frederickpaganpride@gmail.com or join the Volunteer group on Facebook (just request to be added). Here Comes Pagan Pride Day!